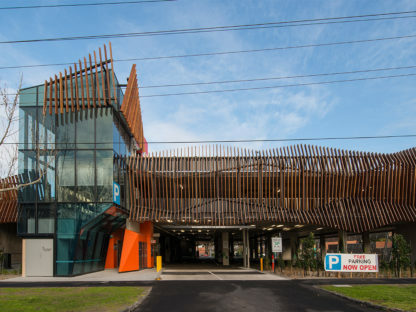 Located adjacent the new Children’s Hospital wing at Monash Medical Centre, this project involved a detailed review of a range of car park design options and philosophies. Through clever planning and use of site levels, the area of our proposal reduced the provided design area by 12%, demonstrating value in intelligent design. Safety in design was critical and a key element of our design approach brought the circulation cores out into the public façade, to ensure safe and visible access to the relevant levels of the building. A range of structural alternatives was considered including increased spans to 164 m to reduce columns, utilising steel, in-situ- concrete, bondek and prefabricated panels. A range of footprints according to with the Australian Standard and the planning scheme were compared to determine the best value for money. "A New Water Arrival Point"